One small sign near street, but not clear direction to door. Menu displayed just twice, but simplified menu makes ordering straightforward. Pay after you get your food, however, line was never too long. Church is tucked on a residential street, so it takes a little to find. Styrofoam plates, but had bulk condiments and recyclable plastic cups. New large sign easily marked entrance to the gym. Also some smaller wayfinding signs out on adjacent side streets. Ordering had changed. It is now three step process. Stop 1 - Order your food and they fill out an order form for you. Stop 2 - Pay station. You give them your order form and they enter your order into an IPad and then you pay. Stop 3 - You give the food servers your order form and they fill your plate. There is a spectrum of fish fry ordering that we've noticed. On one end, you pay and then you tell the servers what you want. On the other end of the spectrum is that you pay and get an "order form" that you give to the servers. There's benefits to both, and Immaculate Conception was on the latter end of the spectrum. Pre-breaded cod and catfish was average, although not bad for pre-breaded. Sides were simple and OK, although the mac and cheese wasn't a strong aspect. Sides included fries, green beans, mac and cheese, and apple sauce. Homemade desserts were a highlight. New menu! Now they have fried or baked pollock, or fish tacos. My the fish tacos were made with the fried pollock. My wife and daughter had the tacos and thought they were good. I had the fried pollock. I'm not a big fan of pollock, so ended up using some tartar sauce. Sides included french fries, hush puppies, green beans, cole slaw, buttered noodles, and salad. Cheese pizza available for kids. Good selection of desserts. Nothing fancy, but all done nicely. $7 for adult plate with two sides. $0.75 for desserts, $0.50 for soda, $1.50 beer. No kids menu, although half plates for $4. 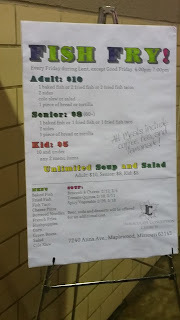 $10 for adult plates, $5 for kids which include any two menu choices. $0.75 for desserts ($1 for pieces of pie). $2 beer (bud light) and $1 soda. Tea and lemonade included. Gym was half empty still at 5pm, but was full by 5:30. High ceiling gym was outdated, but buzz of people grew and overall atmosphere ended up being fair to good. Friendly volunteers. Short wait in line at 6:10pm, but not too bad. The night we went, we enjoyed some entertainment - a girl was doing Irish dance. 2.5 out of 4. 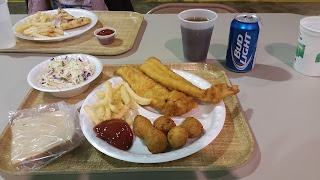 A good local fish fry, however, nothing spectacular. Crowd tended toward the older side. 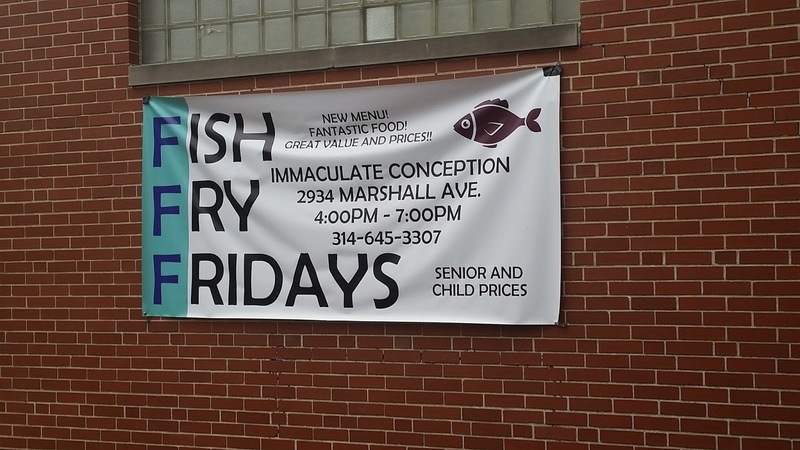 Probably not worth a special trip to Maplewood, but maybe the fish fry can re-invent itself and have a renaissance like downtown Maplewood. Our first trip back to Immaculate Conception since 2009. We liked the new menu. 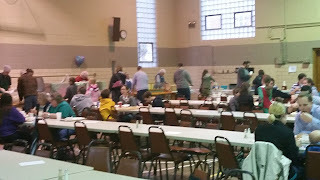 Overall, a very enjoyable fish fry. Nothing fancy - but with friendly volunteers and not being overly crowded, a nice change of pace from some of the more "hectic" and crowded fish fries. 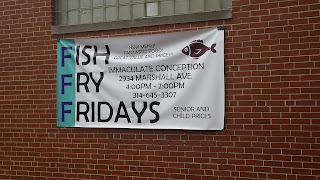 It's always good to see fish fries improving and trying new thing, and with a new menu, tablets as part of the ordering process, and new signs, Immaculate Conception joins that list. 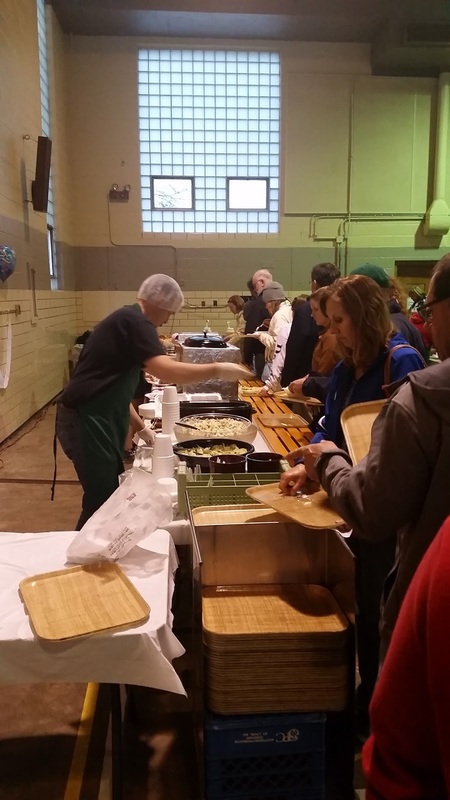 The food is good -- lots of choices and very affordable for good size portions. Desserts are ala carte, which my family doesn't mind as we are there for the fish, not the sweets. Great fry for large families or groups as seating is plentiful. Kids have space to move around and the wait is not long. 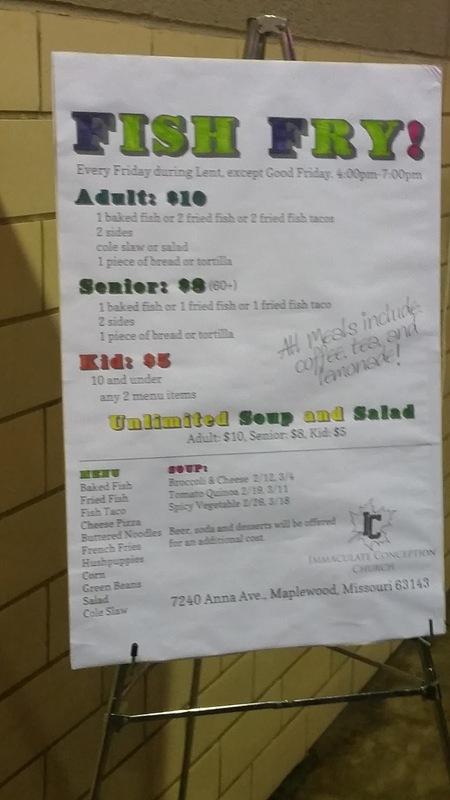 Hey, we'd like to invite you back to IC Maplewood's Fish Fry. New menu, great fish tacos, check us out!! Thanks for the invite! We will try to make it back sometime soon!